The Italian Embassy in Washington DC is engaging the public in an open discussion on digital diplomacy and innovation in foreign policy through the Digital Diplomacy Series, launched in October 2012. The panels have feautured high profile speakers, including author Moises Naim; U.S. Chief Technology Officer Megan Smith; Anne-Marie Slaughter, President of the New America Foundation; Alec Ross, former Special Advisor for Innovation of the U.S. Secretary of State; P.J. Crowley, former Spokesperson for the U.S. Department of State; Katie Dowd and Nathaniel Lubin, formerly with the White House; and representatives of the United Nations, Hushaidi, Change.org, the ONE Campaign, and many more. In the planning of our events, we value partnerships, working with externals organizations, including the United Nations, the U.N. Foundation, TechChange, the Digital Diplomacy Coalition, and Young Professionals in Foreign Policy. For information and videos of past events, click here. If you have ideas for future events, click here. 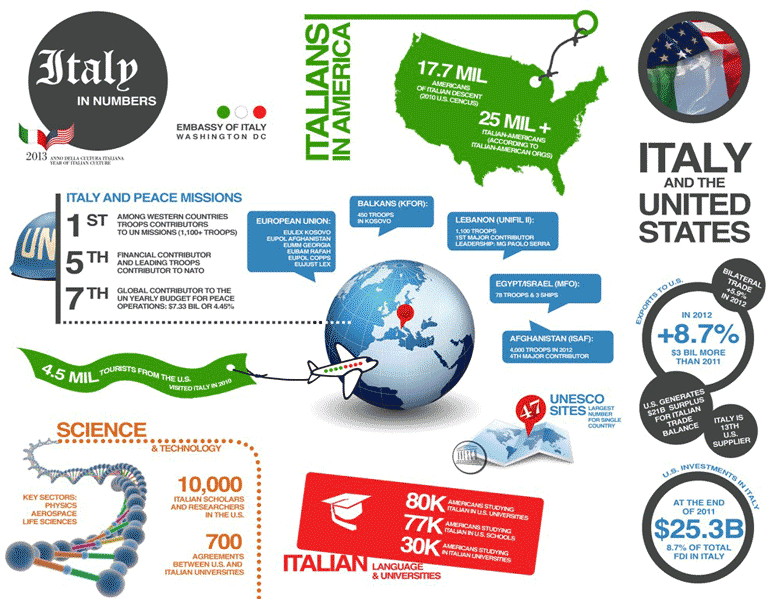 The ItalyinUS portal, online from 2013 to 2017, was curated by the Italian Embassy, Consulates and Cultural Institutes in the United States, and made possible by the daily contributions of a huge network of partners. It was a one-stop shop to find out what we have planned for you, from art to science, music to cinema, literature to language and Made in Italy. It was also a starting point to undertake a journey across Italian culture, a way to discover everything Itaian in the U.S. and, of course, better understand the deep cultural relations between our countries. 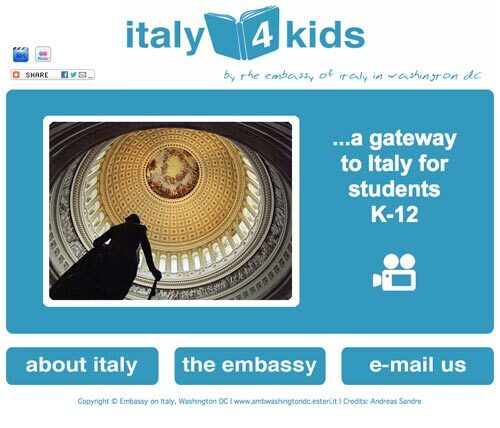 Italy told to American children and students to bring them closer to learning Italian language and culture: this is the objective of Italy4Kids, the online interactive portal created by the Embassy of Italy in Washington and launched on the occasion of the 11th edition of Italian Language Week in the world. Italy4Kids is intended as an interactive and easy to use learning tool. Even the youngest internet users can play games that will allow them to explore Italy’s regions, design an “Italian itinerary” in Washington DC or New York and discover the bonds between Italy and the United States. Started as part of our Italy4Kids web portal and later spinned off, our "A bit of Italy in Your City" mapping project is powered by Google Maps. It allow users to build an Italian open-air itinerary in major U.S. cities. For now, the following cities are available: Washington DC, New York, Los Angeles, San Francisco, and Chicago. And in 2017, we added Boston, Miami, Detroit, Houston, and Philadelphia. More cities will be added in the future. Parmesan vs 100% real Parmigiano from #Italy 🇮🇹 @theonlyparmesan - Who wins #ParmesanGate? #Oscars2016 celebrates 📽 movies from around the world. What's your favorite recent #Oscars winner from 🇮🇹 #Italy? The Embassy experimented a bit with GoogleGlass back in 2013 on the occasion of the launch of the exhibit "Leonardo da Vinci's Codex on the Flight of Birds" at the Smithsonian National Air and Space Museum.